Wiesel was very religious. And he often found Moishe chanting prayers. They struck up a friendship. In 1941, Moishe and some other Jews who could not prove their nationality were deported by the Hungarian government. Wiesel recounts to me what happened next. “When he came back he began talking. Nobody listened to him." [8:34] “Terrible things. Jews. You don’t know what’s happening there. Jews are being killed. He said some people have to dig their own graves. And I was there, he said. He gave names. And I alone … came to tell the tale. Nobody listened to him. They thought he was crazy." Another messenger arrived just before the Jews of Sighet were sent to Auschwitz. 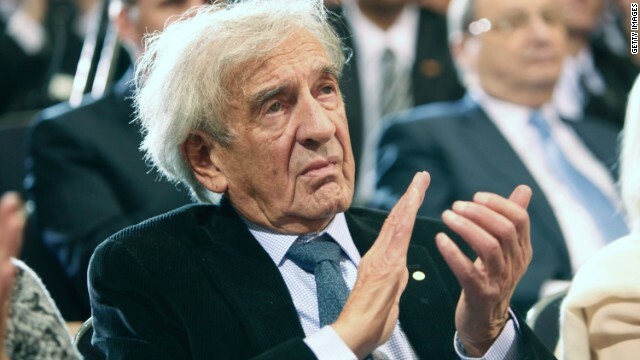 When Eliezer Wiesel and his family arrived at Auschwitz the name meant nothing to them, he tells me. They’d never heard of it. And then, another messenger. This one, heeded. “He knew what we didn’t know,” says Wiesel. “And then,” Wiesel recounts, “something strange happened to me." "I come from a very religious background. Very religious. And all of a sudden, when I saw these hundreds and thousands of Jews coming, from all over Europe, speaking all languages, belonging to all cultures, to all conditions, men, women children, young and old, learned and ignorant …. I had the feeling that this is a Messianic event. The ultimate in gathering of exiles." "The Messiah is coming…That’s what I felt." The story of what happened next is so thoroughly documented it does not need to be recounted here. Wiesel tells me he retained his will to live in the death camps because his father’s life depended on the survival of his son. Together, father and son survived Auschwitz. They survived the grueling transfer to another death camp, Buchenwald. And there they survived, until his father could survive no longer. One morning Eliezer Wiesel woke up, and the bunk in the barracks where his father had been, was occupied by another inmate. Elie Wiesel would survive, to become a messenger. One of the first messengers whose testimony broke through into the broader public’s consciousness. Now, on this day, as the U.S. Holocaust Memorial Museum commemorates its 20th anniversary, there are enough messengers, enough testimony, enough documentation, to absorb many lifetimes of study. And just last month we learned something new and shocking from researchers at the Holocaust Memorial, who had spent years combing through documents for evidence others had glossed over. They discovered that there were an additional 45,000 ghettos and concentration camps, some devoted to killing a small number of people – scattered all through Nazi occupied Europe – that we never knew existed. Which means more civilians than we even imagined knew. How could God allow such a thing, the faithful asked, while it was happening and long after. Could it be that, even though he did not look the part, or act the part – even though he appeared to have lost his mind - could it be that Moishe the Beadle was a Messenger of God? Wiesel made a career and lived off of the Holocaust his entire life. And of course there are some far fresher atrocities going on, such as those in Palestine, of which Mr. Wiesel does not speak a single word. You are obviously ignorant to Professor Wiesel's life and work after the Holocaust. The world is blessed to have this scholar and humanitarian. I had the distinct privilege to meet Mr. Wiesel many years ago. He is kind, humble, brilliant and a tireless voice for victims of genocide and political oppression around the world. Please read more about Mr. Wiesel before you criticize what you believe to be his shortcomings. At the 20th anniversary of the Holocaust Memorial Museum, President Clinton praised Mr. Wiesel for being "the catalyst to save Muslims in Europe". Mr. Wiesel famously criticized then sitting president Clinton at the opening of the Museum 20 years earlier for not doing more to prevent genocide in Bosnia. He is an advocate for human rights and human dignity and a staunch critic of indifference to the plight of oppressed people no matter who they are or where they live. The world is a better place with Elie Wiesel in it. He is a hero to all humankind. I Alone can tell better because i am better than the best.